This is a very welcome new translation of Nāgārjuna’s Mūlamadhayamakakārikā. Mark Siderits and Shōryū Katsura, two seasoned scholars of Indian philosophy, explain in their preface that they have been working on their translation since 1999, and the book comes across as carefully considered. They provide a short introduction that puts Nāgārjuna’s philosophy into its intellectual context. They usefully include the Sanskrit verses, in clear roman script, with a few carefully chosen text-critical notes. Each verse is translated into intelligible English, with explanation of translation issues where required. They also include a short commentary on each verse, with some exploration of the concerns and presuppositions being made, and highlights from four Indian commentaries on the text (the Akutobhayā and those by Candrakīrti, Buddhapālita and Bhāviveka). 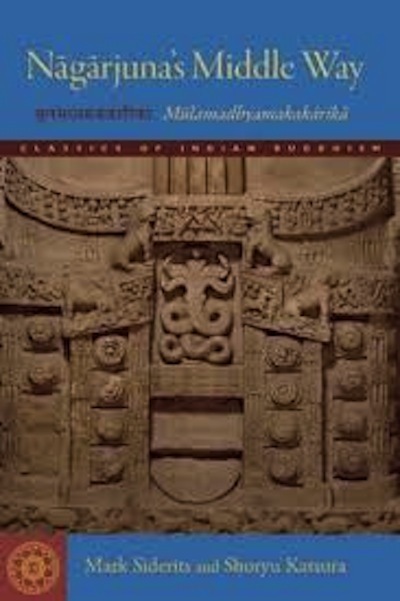 It seemed to this reviewer, as someone who has some knowledge of Sanskrit, that the translation is an ideal combination of clarity in English and closeness to the original, with enough of a commentary to allow the reader to have some sense of the concern with which Nāgārjuna’s verses are grappling. The book is altogether to be recommended as a reliable translation of a central text of the Buddhist philosophical tradition. And perhaps this is all that a review needs to say. But the very success of Siderits’ and Katsura’s translation brings to the fore a rather important question: just what does one make of the philosophical content of Nāgārjuna’s work? Oddly – or perhaps deliberately – this new translation does not try to answer that question. It does not try to interpret Nāgārjuna or make his work intelligible to readers educated in western philosophy. For a reader new to Nāgārjuna, and wishing to make the acquaintance of a philosophical work reputed to be of some importance to the Buddhist tradition, this book may prove not a little frustrating or even opaque. However, this may be deliberate, in that the translators perhaps decided not to put their own interpretation on the text but to try to let it speak for itself. The trouble is that the text does speak very clearly. Not much is known about Nāgārjuna, except that he probably lived in south India in about the 2nd c. ce. Quite a number of works have been attributed to him, though scholars dispute which are authentic. The one thing for sure is that his name is attached to the Mūlamadhyamakakārikā, and that its 447 Sanskrit verses (kārikā) are at the root (mūla) of the middle way school of Buddhist philosophy (madhayamaka). This school was highly influential in India, was transmitted to Tibet, and continues to flourish among Tibetan Buddhists. Nāgārjuna’s work is therefore not just of historical value, but continues to be central to the philosophical side of Tibetan Buddhist culture. The Sanskrit verses, however, are not self-explanatory. They pack their philosophical content into a metrical form, and rarely unpack any of the philosophical details. Indian philosophical texts were put into verse so that they could be memorised by students, and the arguments and issues would later have been explained orally. We do not have Nāgārjuna’s own commentary on the Mūlamadhyamakakārikā, as we do with another of his works, the Vigrahavyāvartanī. Instead we have several commentaries by Indian thinkers of some centuries later, who, although broadly agreeing about the main thrust of Nāgārjuna’s thought, engaged in dispute about how exactly to interpret it. Apart from deciding how exactly to understand Nāgārjuna within the Buddhist philosophical context, there is the issue of how a westerner might relate to any of his philosophical concerns. Let us take as an example the concept of śūnyatā or emptiness, which, everyone agrees, Nāgārjuna wishes to establish as the ultimate truth. Emptiness is not anything in itself but is a concept that refers to how everything is empty of svabhāva or intrinsic existence. Hence to understand the meaning of śūnyatā, just as a concept, it is necessary to understand the meaning of svabhāva as a concept. But in the western philosophical tradition, there is not really any equivalent concept. And even in the Indian philosophical tradition, it is not entirely clear whether Nāgārjuna is setting up his concept of svabhāva as a kind of straw man, or whether any Abhidharma tradition really did suppose that some things had svabhāva in the way that Nāgārjuna says that they do not. All in all, most western readers of Nāgārjuna need guidance about how exactly to read and interpret his verses. In this sense, the new translation by Siderits and Katsura is not very helpful. By contrast, the 1995 translation of Mūlamadhyamakakārikā by Jay Garfield is better. Garfield has not only studied the verses and the traditional Indian and Tibetan commentaries on them, but also engages with them both in terms of western philosophical parallels and Indian Buddhist soteriological concerns. Reading Garfield, one has a sense of why Nāgārjuna might be worth studying. However, and this is an important qualification, Garfield’s translation is based on the Tibetan translation of the Sanskrit verses ­– it is a translation of a translation, and this shows in the relative lack of clarity and precision in language. Siderits’ and Katsura’s translation is simply superior in this regard. Garfield also offers a running commentary on how previous western translators and interpreters of Nāgārjuna have fared: while Murti read Nāgārjuna as an absolutist, positing a reality behind appearances, Kalupahana read him as a pragmatist, and Wood as a nihilist. Garfield disagrees with these previous translators, and takes them to have unnecessarily read western philosophical positions into a work which ought to be understood in its own context. I think that it is here that we may find an explanation of why Siderits and Katsura have elected to provide a rather bare translation of the Mūlamadhyamakakārikā. They perhaps want readers to encounter Nāgārjuna on his own terms, without the imposition of any kind of western thought structure onto a very Indian Buddhist way of looking at things. Jan Westerhoff, in his recent book on Nāgārjuna’s philosophy, offers something of a justification of this approach. He notes that western interpretation of Nāgārjuna has gone from one that makes him a kind of Kantian, to one that makes him a kind of Wittgenstein, to one that makes him a kind of William James. However, it is now possible to approach the study of Nāgārjuna on his own terms, without presenting him in terms of supposed western parallels to his thought. In this regard, even Garfield sometimes interprets Nāgārjuna as a kind of sceptic, in the philosophical tradition that culminates in David Hume. Taking Westerhoff seriously, then, we might suppose that Siderits and Katsura intend their readers to engage with Nāgārjuna on his own terms, and they do so as part of a maturing of the western philosophical encounter with Indian Buddhism. Although they do not say as much, this would at least explain why in their commentaries on individual verses they often refrain from putting forward their own interpretation even when it might have been helpful for the reader for them to have done so. If this is correct, then perhaps the hope is that readers of this new translation of the Mūlamadhyamakakārikā will themselves be drawn into the task of a mature encounter with Nāgārjuna. Such a reader might, however, have to prepare themselves with the older interpretations of Nāgārjuna, which, even if flawed, do provide some orientation. And they might have to read around a bit, in works like Westerhoff’s introduction to Nāgārjuna. Whatever they make of it, this excellent new translation of Mūlamadhyamakakārikā by Siderits and Katsura is a starting point for philosophical reflection, while the bareness of its commentaries, while not exactly helpful, is perhaps a sign of how seriously the translators take Nāgārjuna as an original philosopher. As evident in a recent translation of some of the Dalai Lama’s teachings on the Mūlamadhyamakakārikā: The Dalai Lama, The Middle Way: Faith Grounded in Reason, trans. Thubten Jinpa, Wisdom Publications, Boston, 2009. For which, see for instance another welcome new translation and commentary: Jan Westerhoff, The Dispeller of Disputes: Nāgārjuna’s Vigrahavyāvartanī, Oxford University Press, 2010. This is the place to mention that some western readers of Nāgārjuna have concluded that his philosophy has been over-rated: see, for instance, Richard Hayes, ‘Nāgārjuna’s Appeal’, in The Journal of Indian Philosophy, 22 (1994), 299–378. Jay L. Garfield, The Fundamental Wisdom of the Middle Way: Nāgārjuna’s Mūlamadhyamakakārikā, Oxford University Press, 1995. And this is the place to mention Stephen Batchelor’s translation from the Tibetan, Verses From the Centre, Riverhead Books, New York, 2000; it is a kind of poetical re-working of Nāgārjuna, but of no help for engaging with what Nāgārjuna actually wrote. See T.R.V. Murti, Central Philosophy of Buddhism, George Allen and Unwin, London, 1955; David Kalupahana, Mūlamadhyamakakārikā of Nāgārjuna, Motilal Banarsidass, Delhi, 1991; Thomas E. Wood, Nāgārjunian Disputations, University of Hawaii Press, Honolulu, 1994. Jan Westerhoff, Nāgārjuna’s Madhyamaka: A Philosophical Introduction, Oxford University Press, 2009, pp.9–12.